It’s about that time in the summer when kids are proclaiming, “I’m soo bored, there’s nothing to do.” I found a solution for my family and want to share it with yours too! It’s time to show them the many outdoor activities our North Carolina State Parks offer. From a short hike to a day trip, North Carolina has enough options to get kids unplugged from all those electronic devices and keep their (and the whole family’s) minds and bodies active. Did you know: The U.S. Department of Health and Human Services recommends at least one hour of daily physical activity for kids between 6 and 17 years old. 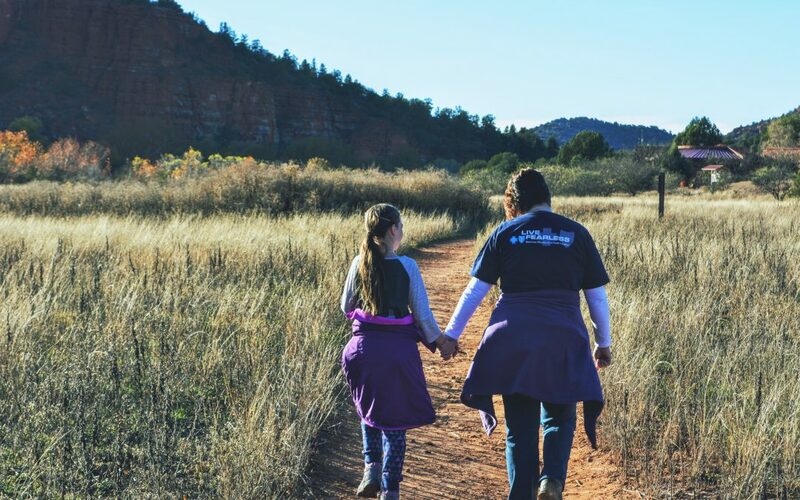 The trailhead brochures offer a great introduction to hiking, allowing first-time hikers (both young and the young-at-heart) the chance to learn about nature and at their own pace.­­­­ Each hike can be a new experience and the trail can look different depending on the season. TRACK Trail activities keep hikers engaged in the hike and active on the trial for longer periods leading to more time for exercise and appreciation of the environment. The Blue Ridge Parkway Foundation and Blue Ridge Parkway created the Kids in Parks TRACK Trails program with grant funding from the Blue Cross and Blue Shield of North Carolina Foundation as an interactive experience for kids and families to get out on the trails along the Blue Ridge Parkway to encourage activity for personal health and wellness and for the benefit of the parks. The program began in 2008 with the first one-mile loop trail at the Blue Ridge Parkway Visitors Center, near Asheville. Since 2011, there have been 130,000 adventures by kids on North Carolina TRACK Trails covering 117,000 miles and burning 17,550,000 calories. That’s equal to working off about 117,000 granola bars while hiking around the globe more than four-and-a-half times! Did you know there are about 80 trails in 45 counties across North Carolina? There are TRACK Trails located in 30 of our State Parks. Our state is celebrated for its diverse terrain and majestic beauty from the Outer Banks to the Blue Ridge Mountains. 2016 is the Centennial Celebration of North Carolina’s state parks, which include one the nation’s first state parks, Mount Mitchell State Park, created at the summit of the mountain, the highest point in eastern North America at 6,684 feet. In fact, the North Carolina park system was the first in the Southeast. Today, there are over 40 state parks. Kids in Parks TRACK Trails’ official ribbon cutting at the Mount Mitchell trail on August 28 is part of the parks’ Centennial Celebration. Check out all the Centennial events throughout the year for an additional reason to visit and to find your own adventure.